A dessert made from beaten egg whites and sugar. The egg whites and sugar are whisked to stiff peaks before being placed in the oven and baked. 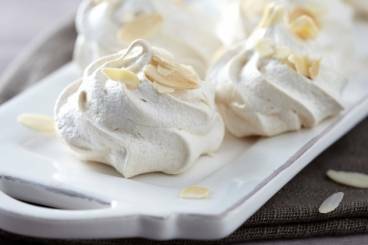 Fluffy meringues topped with flaked almonds - perfect as a sweet treat or served with ice cream. 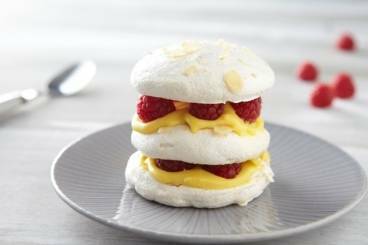 Flaked almond meringue layered with passion fruit curd and fresh raspberries. 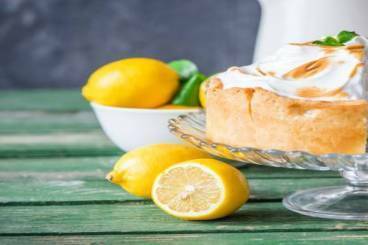 A classic dessert: sweet but zesty tarts made with lemon and lime topped with meringue. Individual vanilla cupcakes topped with homemade lemon curd and sweet Swiss meringue. An easy to prepare lemon scented cake topped with a glazed meringue. An egg white meringue, finished with colours and flavours and quickly baked in a low heated oven. A zingy citrus filling for tarts or pies topped with meringue.